Another fine example of Japanese technolfactory innovation. I missed it originally because I was flying down the endless highways of the Inter-Mountain West in a rental with the cruise control at 80. In addition to a conventional exhaust sensor, the system includes the world’s first sensor system for detecting various other odors, such as from animals, from outside the vehicle – opening or closing the intake vents as needed without constant driver input. 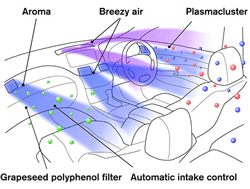 The system also utilizes an inside sensor, located at knee level, to detect cigarette odors and other unpleasant interior smells and increase airflow if necessary. In less polite—less Japanese—terms, it’s a fart-detector! No more blame and denial. No more “I never should have let you order that bean burrito.” The system pulls down the windows and an 80 m.p.h. cross-draft purges the passenger compartment in seconds. Motor Trend reports that the 2011 Inifiniti M will use the Forest Air system. Here is the low tech approach, especially exciting when the windows go down at 80.